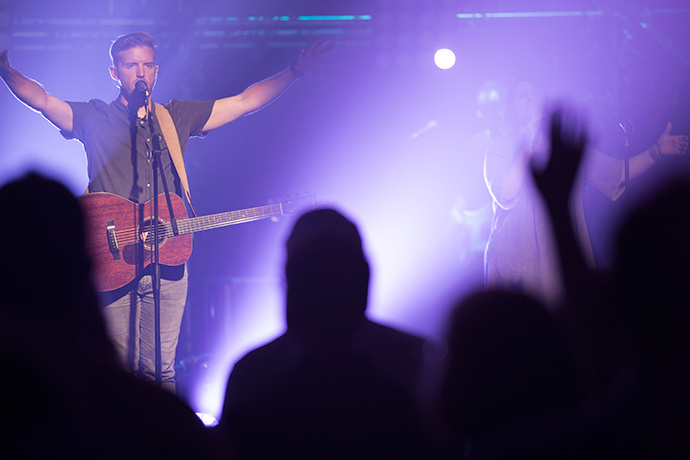 Five years ago, The Woodlands Pastor of Contemporary Worship and Community Growth, Mark Swayze, joined the New Room conference as the worship leader. The first year, the conference hosted 400 pastors and lay leaders. Each year since, attendance has doubled. Over the course of the Awakening tour, the team will stop at six local churches, and nine college campuses to minister to, and with, Wesley Foundations. They typically spend each day encouraging and ministering to Wesley Foundation Leadership before holding the service that night. Each service begins with an extended period of worship followed by teaching on the Awakening movements by New Room Executive Director Dr. David Thomas. “He teaches about this idea of ‘travailing prayer,’ said Swayze. According to Thomas, prayer is the common thread in all Awakenings over the course of the past 300 years. Revival follows on the heels of God’s people fervently praying for him to come. Although the team plans for a 90-minute service each evening, passionate students sometimes stretch the service much longer. At the University of Georgia, Wesley Foundation students lingered praying and worshipping for more than three and a half hours. Each night, after the last college student has returned to his or her dorm or apartment, the team packs up and then joins a host family for the night. The next morning, they hit the road again. At the eight-day mark of the tour, Swayze sounds a bit tired, but most of all he is excited to be a part of God’s work through the Awakening Tour. “So far, we have done 11 services in 8 days,” he said. And God is just getting started.